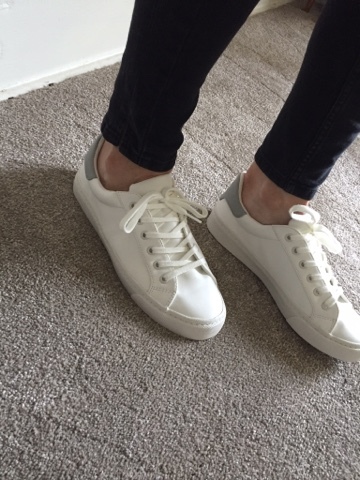 I've been wearing my Topshop white trainers so much recently that I figured it was time I invested in a second pair. Mainly because the Topshop ones are a bit flat and not overly comfy to wear for long periods but also because I get bored of wearing them and would like to have a second pair to mix things up. 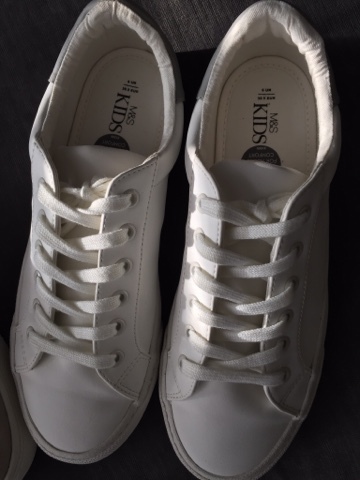 I do have a pair of Adidas Superstars but I've gone off them recently....they feel too 'kiddy'....probably because so many of my kids' friends have them too. I want to leave them aside for a while until teenagers stop wearing them and move onto something else! 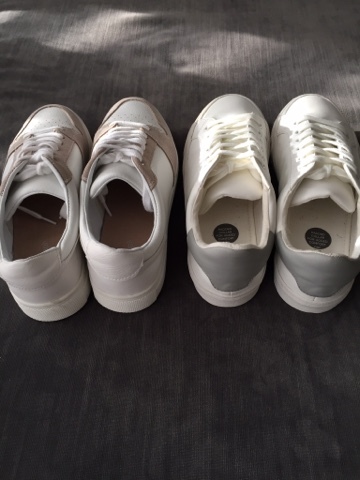 So I was in M&S the other day and picked up a couple of pairs of white trainers to try out at home. First up, these are a ladies pair. 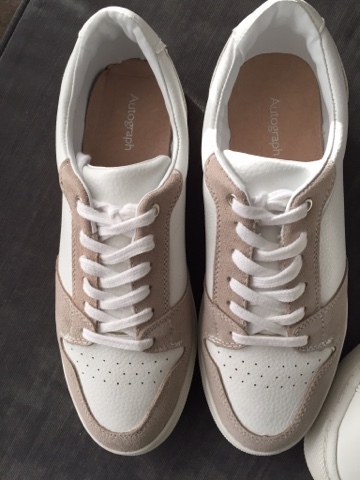 They're the white version of the blush ones I tried on in my last post but this colour way is not in the sale. 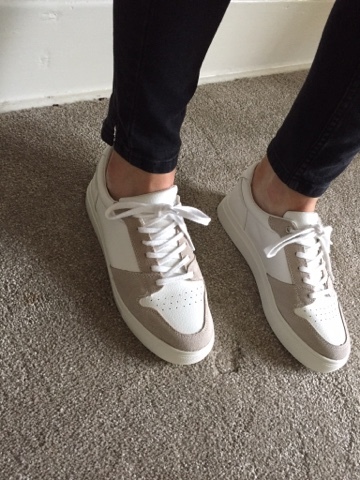 Pricey at £45 but they are leather and looked comfortable. I'll be honest, I wasn't blown away by them. They definitely look better off than on..
After reading the reviews on the M&S website, I sized down ordered a 5. They don't come up a full size too big though and these were just too small for me. However, I know the 6 would be too big and there are no half-sizes. Also, I was less than impressed with the finish for the money. The insole in my pair was quite poorly cut out and was a bit crumpled. All told - not very Autograph. So in summary, they're a return. I would have considered them if I could have bought a half size and if they cost about £30/35. But then I was upstairs looking at the kids clothing and I spotted the ones on the right - in the boy's section. I was attracted by the grey finish on the heel and they are only £20 - available right up to a size 7. I preferred these on but you could tell why they were less than half the price. 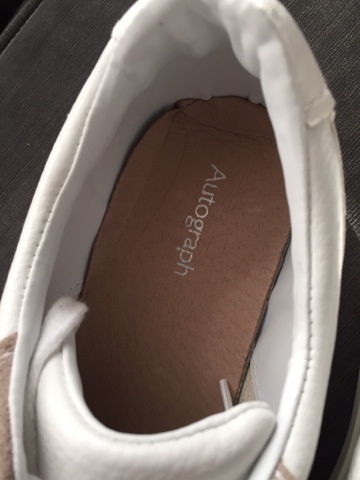 They're not leather lined like the Autograph ones and they aren't just as springy under foot. But they're much more along the lines of my Topshop ones (which in turn are along the lines of some YSL ones!) and they have a lovely shape that really appealed to me. I'd recommend these - they were a reluctant return. But they look almost the same as the ones I already have and I'd quite like something just a little bit different. Size wise also, I fell foul of the lack of half sizes. The 6 was a little big on me but the 5 was too tight. 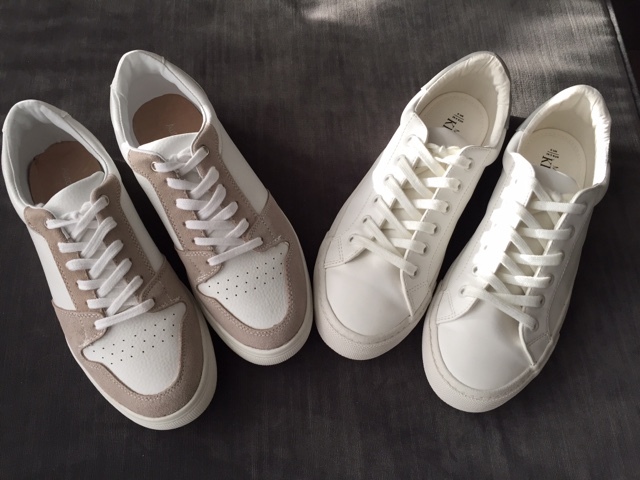 But a great option if you're looking a simple white trainer to test the water on this trend. 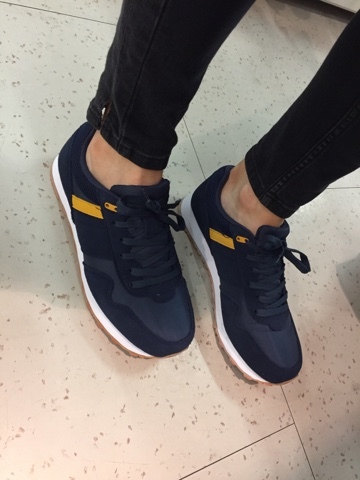 Incidentally, while I was in the kids department, I spotted these retro looking navy trainers. A bargain at £22! These were super comfy and came up a bit bigger in size and so the 5 was a nice fit on me. 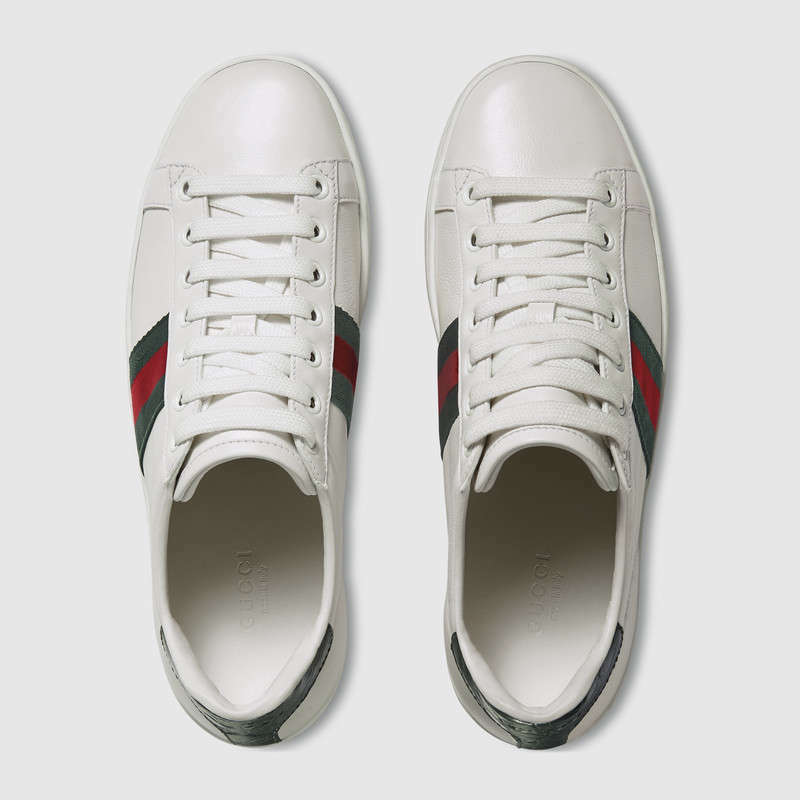 So the search continues...I just need to stop thinking about these Gucci ones. They're making everything else look so lacklustre. 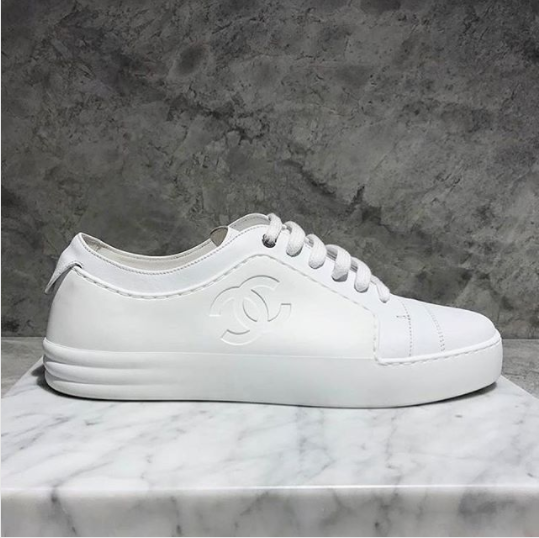 and as for these Chanel ones....SWOON...don't even ask the price! 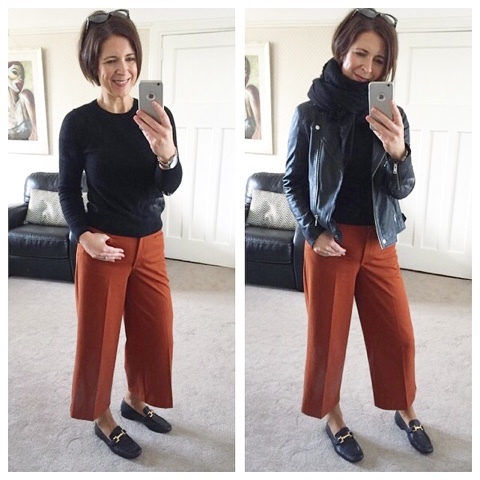 Finishing with a couple of outfits from the past week..